Visit Raleigh is pleased to offer housing services for conventions, meetings and events utilizing two or more hotels. We use Meetingmax, which allows us to provide your participants with a state-of-the-art housing program. Our online housing service can help to increase pick-up for your contracted hotel blocks by providing an easy-to-use, centralized and attractive portal for your attendees. This minimizes the appeal for your attendees to access third-party booking sites instead. A big benefit is better control of hotel inventories. Planners, hotels and housing staff see inventory statuses and can make quick changes to better meet attendee needs while maximizing room blocks. Meetingmax allows for multiple sub-block utilization, too. Easy-to-access reporting features allow planners to view booking patterns, track accurate commissions and rebates and access important historical reporting, which will help with economic impact assessments. It&apos;s affordable! The cost to use Visit Raleigh/Meetingmax housing service is $2 per room-night. This charge can be included in the room rate or can be billed to the organization for direct payment of the cost. Meeting and event planning best practices tell us that it&apos;s wise to decide if you will use housing (or not) up-front and before you sign your hotel contracts! 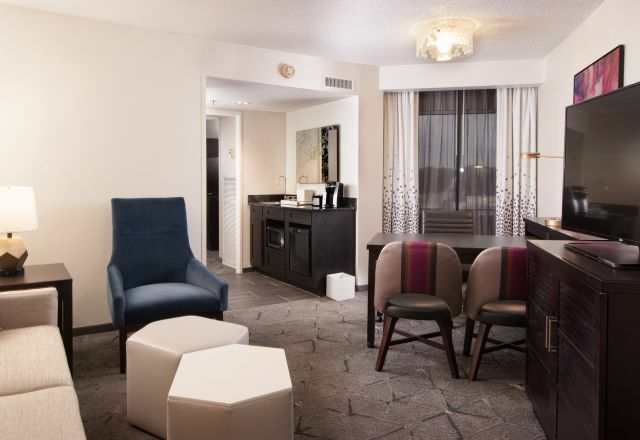 But if you make a decision to use housing after you&apos;ve already booked to come to Raleigh, N.C., no worries; our housing staff will work with you to facilitate hotel addenda to ensure that the hotels, Visit Raleigh and our clients are aligned with the plan. We do the work, and you and your attendees enjoy the benefits! We are proud to offer our housing services to your group, and with Meetingmax, we can give you and your attendees a reservation system that has become a hospitality industry standard for good reason! Please contact us for more information on housing for upcoming meetings and conventions.